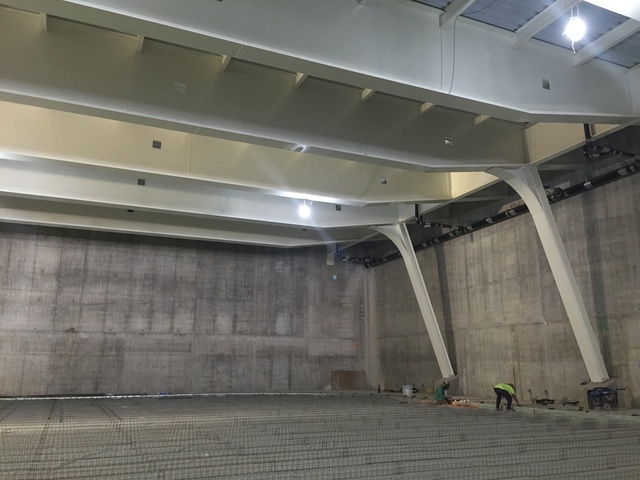 Little Caesars Arena is starting to take shape, but a lot of the progress being made is happening underground. Red Wings Director or Minor Hockey Operations Darren Eliot took 7 Action Sports reporter Kacie Hollins 40 feet below street level to what will be the new practice facility for the Wings and the home of Little Caesars Triple A hockey. Having a designated practice rink in their new home means the Red Wings don’t have to share nearly as much. “Last year even they were displaced because of concerts and stuff at The Joe. [It’s a] very busy venue,” explained Eliot. Superintendent Chris Clark explained that to get the practice ice perfect, and evenly frozen, they’re using a system of pipes laid under the playing surface. In total, there will be 12 miles of pipes under the ice. This piping will be laid on top of warm piping and insulation. “The idea of the warm piping is to actually keep the earth underneath from freezing. So when it freezes you don’t heave the concrete,” explained Clark. The Red Wings aren’t the only ones using this practice rink. It will be home to a youth league too. “I wish was 12 years old again for a lot of reasons, but certainly from a hockey standpoint…state of the art. There will be facility where you do the studio training, where you have a lecture hall, 28 person lecture hall, tutorial rooms. Everything that a student, a family, and athlete could ask for all in one spot,” said Eliot. In addition to the state of the art facilities, the youth league will also have their own locker rooms. That means they won’t have to share with the Red Wings, although it’s safe to assume they wouldn’t mind even if they did!